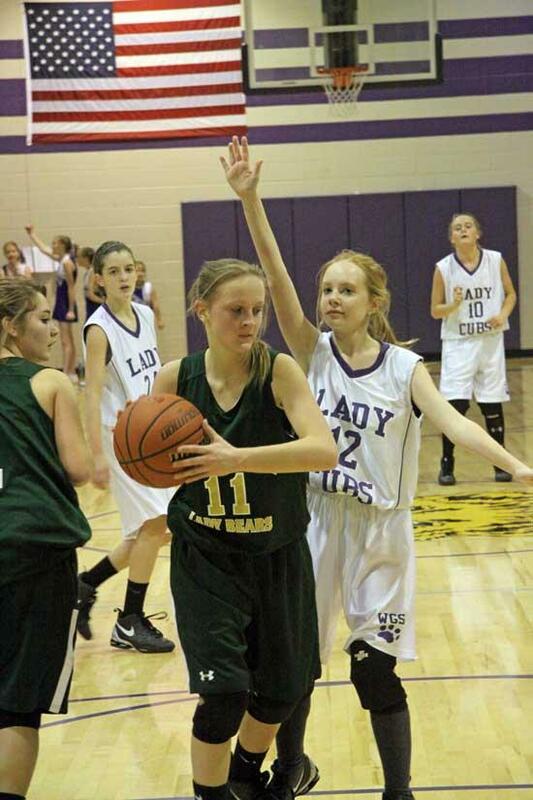 Short Mountain’s Lauren Simmons, 11, pulls down a rebound and Woodbury Grammar’s Rachel Pate, 12, defends during quarterfinal action in the 2010 Cannon County Cancer Tournament Tuesday. Woodbury Grammar's girls basketball team enjoyed a three-for-one special during the opening round of the 2010 Cannon County Cancer Tournament Tuesday afternoon. Not only did the Lady Cubs earn a spot in the semifinals against No. 1 seed and unbeaten Auburn by virtue of their 36-16 win against Short Mountain, but they also guaranteed themselves two more games this week. Woodbury Grammar is also guaranteed a game Saturday either in the championship, or a consolation affair. "I told our team they were in control of whether we played one game this week or three and I expected nothing less than for us to be playing three," Lady Cubs coach Felicia Walkup said. "I'm still looking for a complete game but the girls played well overall and it's good to move on in the tournament. It will be tough against Auburn. To this point they have shown as the strongest team in the league." Woodbury Grammar faces Auburn Thursday at Woodbury Grammar at 4 p.m., in the first of four semifinal games that will set Saturday's championship games. Kaylee Hayes and Emily Sissom were two big reasons Woodbury is playing another day - or two - in this annual tournament. All proceeds are donated to the American Cancer Society. Hayes and Sissom shared game-high honors with 13 points each. Hayes also added four rebounds. Haily Paterson was also strong on the boards for Woodbury Grammar with five rebounds. Ciara Riddle (5) and Raven Cagle (4) led Short Mountain. Woodbury Grammar jumped out to a 10-2 first-quarter lead and controlled the game from there. Efficient offense and good ball movement helped generate the 36-point effort. "I was pleased with our ball sharing," Walkup said. "Sometimes we get caught up in dribbling, not passing, so I was pleased to see us share the ball and get some good shots." No. 3 seed West Side moved into the semifinals with a 48-36 win but No. 6 East Side would not go quietly. Kendra Maynard led West Side with 14 points and three rebounds. Autumn King and Kelsie Smith each scored eight points and McKenzie Adams netted seven. King also hauled in three rebounds for winning West Side. Upset-minded East Side, which was led by Kelli Davis' 15-point, five-rebound performance and 10 points from Kelsey Wilson, actually led 7-5 after the first quarter before the Eaglettes used a 18-point second-quarter offensive outburst to take a 23-13 lead into the half. Caren Fox was also a factor for East Side with eight rebounds. West Side was never seriously threatened in the second half, but East Side stayed within striking distance throughout to keep things interesting. West Side will face No. 2 seed Woodland in semifinal action Thursday at 7 p.m.